Fig. 1: Computational domain for numerical simulations of a turbulent pipe flow. Fig. 2: Turbulent statistics using only 6 points with uniform or non-uniform grid spacings in the wall-normal direction. (a) Mean streamwise velocity profiles (solid lines with markers) and the law of the wall (dashed line); (b) RMS velocity fluctuations. Fig. 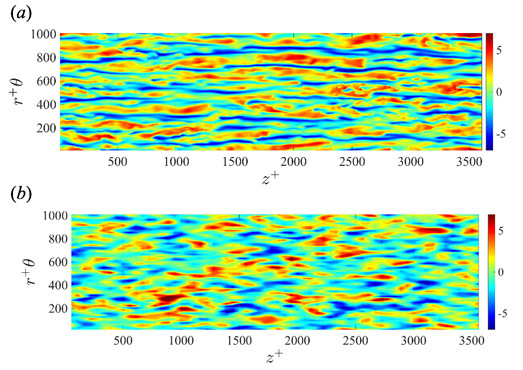 3: Instantaneous streamwise velocity fluctuation contours at y+ = 20 in the turbulent pipe flow. (a) DNS; (b) LES in the case of (Nr, Nθ, Nz) = (6, 64, 64). Fig. 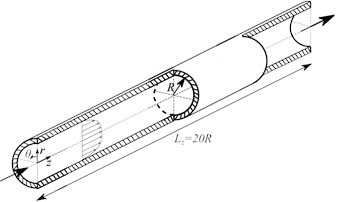 4: Relationship between the wall-normal location of the first grid point from the wall and the resultant values of turbulent statistics there: (a) mean streamwise velocity; (b) RMS streamwise velocity fluctuation. (2) Mizobuchi, Y., “Development of automotive engine combustion simulation software “HINOCA”,” Journal of the Combustion Society of Japan, Vol. 58, No. 186, (2016), pp. 191-196. (3) Nicoud, F. and Ducros, F., “Subgrid-scale stress modelling based on the square of the velocity gradient tensor,” Flow, Turbulence and Combustion, Vol. 62, (1999), pp. 183-200. (4) 桑田 祐丞，須賀 一彦，「正方形角柱群内乱流の LES による体積平均乱流輸送方程式の考察」，日本機械学会論文集（B 編）, Vol. 79, No. 805, (2013), pp.1752-1763. (5) Meyers, J. and Sagaut, P., “Is plane-channel flow a friendly case for the testing of large-eddy simulation subgrid-scale models?,” Physics of Fluids, Vol. 19 (2007) , 048105. (6) Fukagata, K. and Kasagi, N., “Highly energy-conservative finite difference method for the cylindrical coordinate system,” Journal of Computational Physics, Vol. 181 (2002), pp. 478-498.